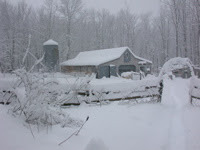 April 13, five more inches of snow. April 15, snow and rain. April 16, wind and rain and power outage. April 17, snow and rain. April 18, rain. Will this nightmare ever end??? Fifteen inches of “poor man’s fertilizer” on April 5, for God’s sake.